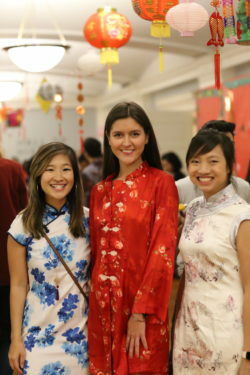 The savory aroma of hot dumplings, fried spring rolls, and hot pot filled the decorated halls of International House as Residents in line for food made their way into Davis Hall, where lions roamed and spectacular performances awaited. 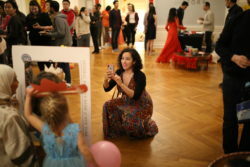 On February 8, 2019, Residents and other members of the I-House community celebrated the Lunar New Year with each other, marking an exciting and auspicious beginning. 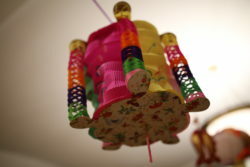 While Westerners celebrate the New Year under the solar calendar, many East Asian countries pay tribute to Lunar New Year, which is based on the traditional Chinese lunisolar calendar. The new year typically occurs in late January or early February. There are 12 Chinese zodiac animals used to represent the years, and 2019 marks the Year of the Pig. 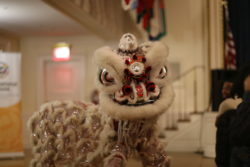 Originally observed in China as the Chinese New Year, this celebration spread to other countries and has evolved to mold their unique culture and national identity. 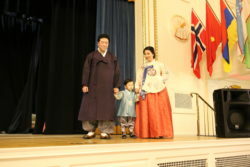 Its variations include the Korean New Year (Seollal), Mongolian New Year (Tsagaan Sar), Tibetan New Year (Losar) and Vietnamese New Year (Tết). 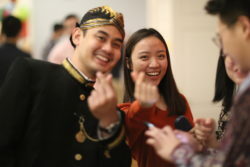 Additionally, overseas Chinese communities also celebrate the Lunar New Year in Singapore, Indonesia, Malaysia, Myanmar, Thailand, Cambodia, the Philippines, and other places in the world. 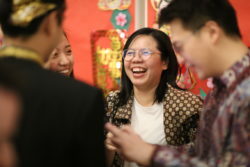 Because it is celebrated in various countries, I-House organizers and participants planned to make the Lunar New Year celebration as diverse and dynamic as possible. The event started with attendees signing in; each was given a raffle ticket for prizes to be announced at the end of the event. 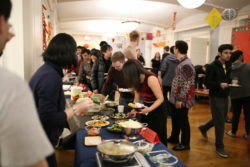 A line soon formed for food tasting, a combination of catering and delicious homemade dishes made by Therese Tran, Jeffrey Wang, and Jingwen Yang, who are all pursuing Actuarial Science at Columbia University. 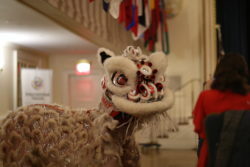 The Hall was illuminated with lanterns, an informational booth, posters, decor, and photo session stalls, giving an authentic and homey feel to Residents and other attendees. 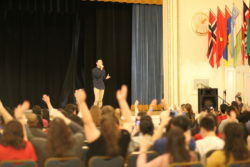 The MC, Nelson Lin, ushered everyone into Davis Hall, where he introduced the agenda and delivered comedic punchlines. 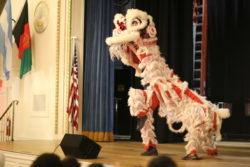 Afterwards, the Columbia Lion Dance Team opened up the show with a lively lion dance accompanied by sonorous drumming. 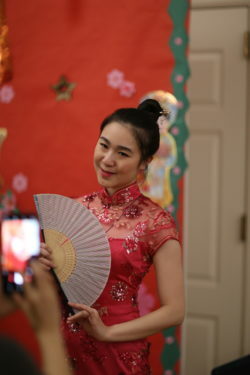 Following that was the highly anticipated traditional costume show: I-House Residents transformed into runway models as they walked across the stage and showcased traditional clothing from countries that celebrate the Lunar New Year. 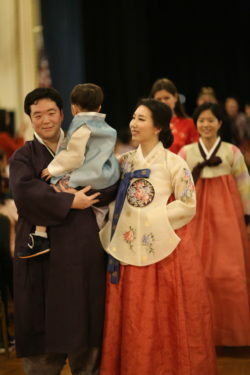 The heart-warming show began with a family from Korea (Ji Won Moon with his wife, Narabora Lim, and their child) wearing traditional Korean clothes. 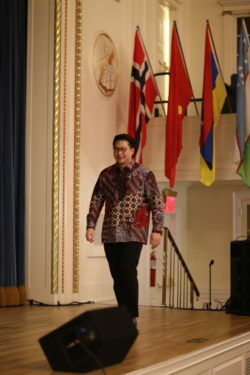 Following were Residents who showcased traditional clothing from countries that celebrate the Lunar New Year: Anastasya Toropova, from Russia, modeled a Malaysian outfit; Seoyeon Kim wore Korean traditional dress; Wenxi Lin, Julieanna Luo and Hanhan Li wore traditional Chinese dresses; Daru Dewi and her friends showcased Indonesia attire; and Thuy Hang Tran, Brenda Khor and Therese Tran wore traditional Vietnamese dresses. 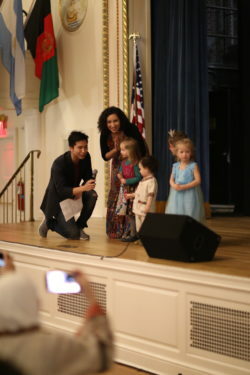 The show concluded with the young children of Resident families from Syria, Chile, and the USA frolicking around the stage. 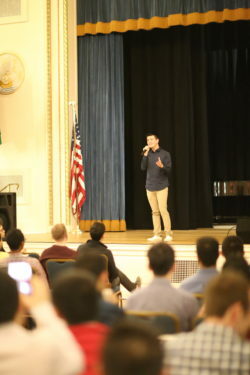 The event continued with breathtaking performances by I-House Residents. Benny Lin sang Say Meow Meow and Our Teenage Years by TFBOYS, and Liutong Zhou sang Vaga Luna Che Inargenti. 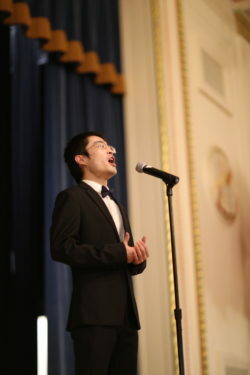 David Cartolano, a medical student at Columbia, enlivened the crowd with his guitar rendition of Jimi Hendrix’s “Red House.” Two pianists, Isabel Keleti (who played the Bach Toccata in E Minor) and Sisi Liu (who played “Glowing Red Morningstar Lilies” and “Defend the Yellow River”) set a melodramatic yet vibrant tone as they delivered their individual pieces. 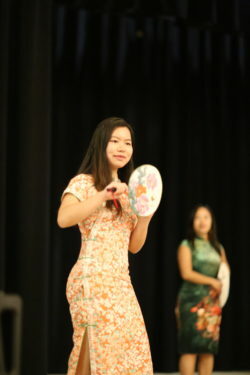 Wenxi Lin also captured the crowd with her delicate yet vigorous dance, the style of which originates from the Miao, one of China’s ethnic minority groups. 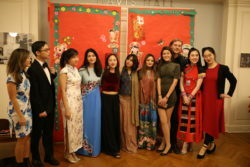 There were dual performances including David Cartolano playing guitar while Mafer Vui sang “Fragrance of Rice,” and another by Sisi Liu and Wenya Poh, who sang “Confession Balloons” (Gao Bai Qi Qiu) and “Twilight” (Bu Wei Shui Er Zuo de Ge). 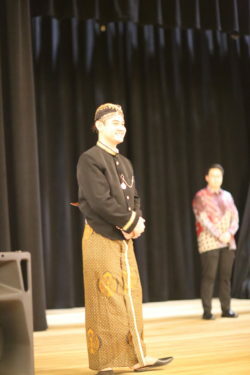 The program ended with the Resident Council president, Apoorva Gupta, announcing lottery ticket winners, who were given a variety of prizes including movie tickets, oriental wallets, and money in traditional red envelopes. Afterwards, Residents were invited to an after-party at the I-House Pub featuring a special Japanese guest DJ, Takaya Uchida. 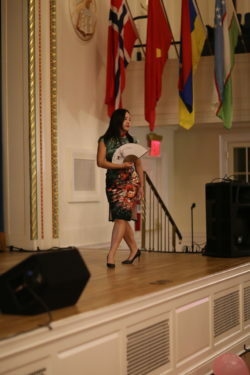 Funded by donor support of International House and facilitated through the Office of Admissions, Programs & Resident Life, the Resident Council sponsored and coordinated the event, led this year by the Council’s East/Southeast Asian regional representative, Thuy Hang Tran. 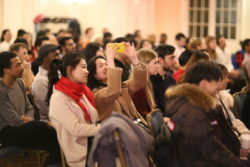 The event was truly a community collaboration, with diligent teamwork by the Resident Council members: Apoorva Gupta (President), Johannes Neumann (Vice President), Ray Luo (Trustee), Katherine Long (Trustee), Alan Spadone (Programs Chair), Noel Coenraad (Secretary & Treasurer), Anastasya Toropova (Member At-Large), and the other regional representatives Michelle Lee (North America), Kirti Dixit (South & Central Asia), Fabio Hanna (Latin America & Caribbean) and Irina Maya (Europe). The DJ of the night was Johannes Neumann,a Ph.D. student in Comparative Biology at the Richard Gilder Graduate School at the American Museum of Natural History. 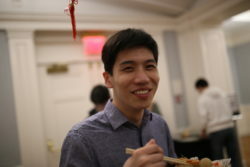 Photographing the event was Ray Luo, and Michelle Lee (Taiwan/USA) served as the event’s financial accountant. 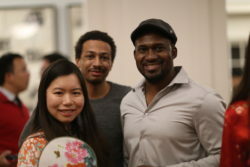 I-House Cultural Fellows, WIL Fellows, I-House Fellows and many other Residents helped make the event spectacular. In a Facebook post, Álvaro M. Carreño, a Resident from Chile who is obtaining his Master’s in Public Administration at Columbia, gave a shoutout: “My family and I had a great time! 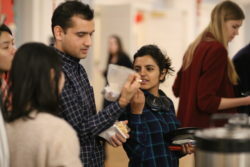 I was happy to see different members of the community coming together to celebrate and share what’s valuable for them…and also very happy to see other families participating and being included!” The enthusiasm and appreciation reinforced an exciting and supportive beginning for both old and new Residents, navigating a new semester here in New York together. Thuy “Hangelina” Tran, who goes by “Hangie,”(pronounced “Angie”), is obtaining a Master’s in Education Policy at Teachers College, Columbia University, where she advocates for comprehensive educational opportunities for underprivileged students. 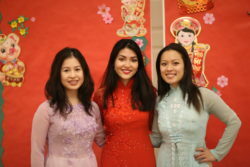 Hangie was born in rural Vietnam and emigrated with her family to the US at an early age. Before coming to NYC, she was a Fulbright Scholar in Mexico and also taught English to immigrants and refugees in Atlanta, GA for more than 5 years. She speaks Vietnamese, Spanish, and English fluently. In addition to being an I-House Press Corps Fellow, she serves on the Resident Council as its Representative for East and Southeast Asia. When she’s not trying to learn a new language, you’ll see her running at the gym while grooving to hip-hop or reggaeton. Read more of Hangie’s writings on travel, decolonization, and self-care on her website.